In presenting the platform, Premier Dunkley said, “Good morning Bermuda. I’m proud to be here this morning with my colleagues to present the One Bermuda Alliance platform for the 2017 general election. “It’s a plan for Bermudian progress on a very broad scale. The press conference has just concluded; we will have more information later. In the meantime, the 37-minute live video replay of the press conference is below. Hey Ralph, how about that Vision 2025 huh? Happy to wait that long to see failure…again? The PLP are the ones that cannot be trusted. No platform, no plan…just crazy fake news nonsense from Burt and Co.
Is the OBA having a public rally or are they afraid to reveal the 2 Bermudas? There’s not 2 Bermudas. Actually there’s more like 379 different Bermudas . No rally needed. OBA supporters are too busy working and moving this country forward to waste time on silly rallies and marches. You go ahead. More like the oba/ubp is afraid to show only 1 side of Bermuda. The things they continue to hide………..THE TRUTH!!!!!!!!!!! Pep rallys are for school sporting events This is an election. It is not a sporting event. 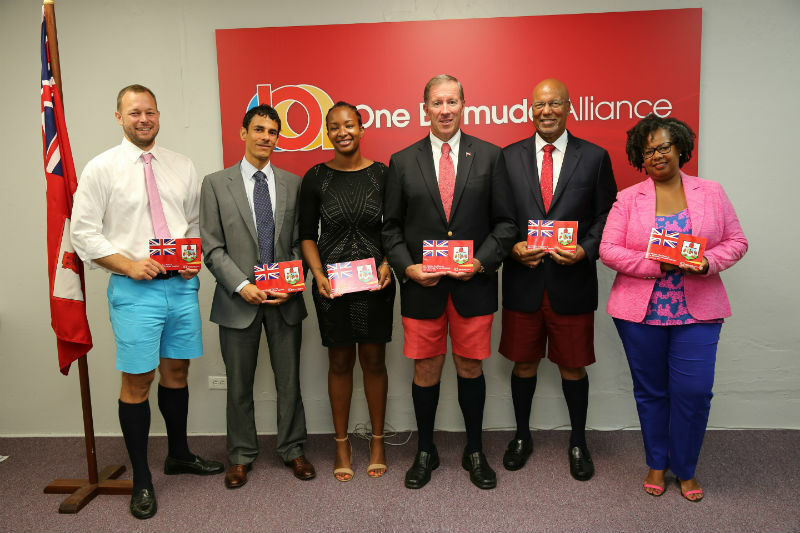 It is about the very serious business of electing the best group to successfully manage Bermuda. It is not about waving paper flags or shouting meaningless slogans. I’ve heard a Pep Rally in stores overseas prior to opening. They are a good use at any function to meet your votes. Sorry OBA just had the AC. There you go, they’ve had theirs! You aspire to be an american walmart worker? Sad. If your saying you can’t trust the OBA then surely you can’t even think for one second of supporting the PLP… with $800 million missing, a Commission of Inquiry Report and a prpven track record of increasing government debt! Well Scotland Yard needs to be fired. they still haven’t fulfilled the promises from 2012 yet now they are making even more that will be harder to fulfill. Really? The economy is starting to grow after 14 years of incompetence. Without that, it’s all meaningless. Other than raid the pension pot, I don’t see anything tangible in the PLP’s plan for economy. Just empty platitudes. The PLP cannot run on their 14 year record, it was so awful. 2025 is too long to wait until we see them fail again. Aceboy: The UBP/OBA have a 500 year record that is based on them being the gatekeepers of systematic oppression. Like Shawn Crockwell stated in his last speech “the OBA is the UBP and he was on the inside looking out and not on outside looking in. 500 year record? Where do you get that from? yet the PLP doesn’t want to talk about its record from 2007-2012. Interesting. How old is Bermuda? Didn’t know we were 500 years old! The lies the PLP tells….so sad, so juvenile. Wayne Furbert is the greatest MP! Sorry. I am only confused! You mentioned that you will extend after school programming from 5:30pm. If you not aware let me help you! After school care in government actually finishes at 6:00pm, so are you saying that it will extend to 6:30pm. Not sure how thas going to work as you cut the buget and closed several after school,summer and mid’term programs. The UBP/oba platform explains to the voters I don’t need to make any sense. I just have to make you believe I do. Say bye bye UBP/oba. After getting crushed on July 18th the former BDA members that merged to form the UBP/oba need to jump ship and re form the BDA party. I will never vote for a party that was made to trick voters to win an election using surrogates as front men & women. Hope you realize that that is what the PLP have done over and over again too, using ‘cogs’ and ‘legends’ to prop up and the illusion that they are a united party for the people, instead of the fact that they are a party for the party… or at least which ever oligarchy is ruling the party at the time. We had to deceive you! Anyone seen Michael Fahy ? Hello ? Or Barton for that matter? I asked the same question the other day, and from the answers I got he has been muzzled and put in the kennel until July 19th. They are afraid that he will only stir up more unrest just has he has all along. The same appears to have happened to Gordom Pamplin, Who has seen or heard a peep out of her. I just hope peopleare paying attention to the same. You should worry more about what you do not hear or see from the plp. 1. Jump Start Savings Account for every newborn Bermudian – seeded with $2,500 – where is that money coming from? Weren’t we broke like last month? 2. Provide classroom teachers with $1k annual budget for classroom requirements and supplies – again, where the money coming from? That was not in this year’s budget as explained by Minister Cole Simons’ statement last week. 3. “extending” an ‘authority’ approach to Education – sounds like they are privatizing the education system as they did with the Tourism department. 4. Will move to have the appropriate international conventions extended to Bermuda so we can use our driver licenses to rent cars overseas without issue – - what they don’t say is when we sign the convention, then all those countries that are on the list CAN DRIVE HERE – period. 5. Develop a cashless payment system for the island’s buses and ferries – great idea in principle but what is the cost to completely change to current system? Any thought given to improve the current system? 6. Establish a Senior Advocate Office – more privatization – and what’s the costs associated with this office? Who is paying for it and how? 7. Will create a Caregiver Resource Center – same as #6. 8. Fixed term elections every five years – this was on the original OBA platform – they never did it. 9. Absentee balloting for immediate implementation – same as #8. 10. We will turn our focus to building a Causeway for the 21st century – this is a pie in the sky promise – if they didn’t have funds to do it all this time, again, where is the money coming from now? 11. Consult stakeholders for the creation of an independent taxi and minibus Commission – privatization again – why? TCD has a board of public individuals who do this currently, who are appointed by the government yearly. #1 is terrible politics reserved for the PLP! But if it is wrong for the PLP, it must be wrong for the OBA! As far fetched as the 2025 plan also!? I’m still digesting it but to your point 1, $2,500 for every newborn baby….is this for the millionaires/billionaires babies too? Aren’t they rich enough? - not sure where, the money for this would come from, but it is a good idea. Based on the annual birth rate in Bermuda of around 600, and roughly 400 of those being Bermudian, would be looking at needing a budget of around $1M, so not outside the realm of possibilities. - this would not be impossible to start this fall, after all we are under budget for the AC so there should be funds available, not sure what the annual budget would need to be though. 4. Will move to have the appropriate international conventions extended to Bermuda so we can use our driver licenses to rent cars overseas without issue – – what they don’t say is when we sign the convention, then all those countries that are on the list CAN DRIVE HERE – period. - yes, all, those countries would be able to drive here, but they already can, just rental bikes and the ‘twizies’. They would need to live here for regular vehicles. - I too would like to see this proposal, but I have greater hope in Minister Richards finding an answer than anybody on the PLP team. Burt mathematics still asserts that we are losing $2B+ with the airport deal, and given the mess the Ministry of Finance and the government financial matters were in when he was in it last time… I’ll take Richards’ poor cumminications skills over Burt’s side talk any day, when it come to handling the public purse. - TCD is not a model of effectiveness in managing affairs, frankly a privatized and accountable entity isn’t a bad deal. So, the OBA is planning on doing things the save the taxpayer money. The OBA is looking at privatising civil service departments which have been grossly inefficient for decades. The OBA wants to give good value for tax dollars. The problem with this is? Ask one question of the OBA that you always asked of the PLP. Just one, the people might take you more seriously. Like : where is the money coming from for these promises? Or is that “anti-Bermudian” which is code for: how dare you hold us to the same standard?! We still don’t know where the money went so ask yourself that question. Oh yes you do. They spent it on those ferries you rode to the America’s Cup. They spent on those buses you rode to the America’s Cup. They spent on the cruise ship dock that the tourists kept coming to on ships throughout the recession when air visitors tanked.They spent it travelling to London and Brussels to sort out Solvency II. They spent it backing up your Bank which was too big to fail. They spent it on maintaining services while giving retail and supermarkets tax breaks since 2009. They spent creating FutureCare and increasing pensions so seniors would have some dignity. They spent it travelling to the east coast to bring you Jet Blue and West Jet….get the picture ? Everything you now take for granted and used so willingly to show off the Island for the America’s Cup was what THEY spent it on. So you know full well where the money went; you just don’t like who spent it. Funny thing is, all the examples you cited are all the ones accounted for, they have those receipts. It is the unaccounted for that people are still demanding to know, $800m in missing receipts. You mean, like ‘plantation questions’? If you read the document, you will see that the $2500 will be given to each child, on their 18th birthday. The amount, per child will be invested, and hopefully the value will increase by the time the child reaches 18 years of age. It is not intended to be doled out when they are born, so there is no need to be asking where the money is in the immediate juncture. Zuckerberg and others have been talking about a universal basic income, to recieve a salary for just being alive rather than being born indebted to a system. Your explanation of the OBA version is a little muddled, if they receive the cash investment at 18 then hope it increases in value by the time they reach 18. $2500 hundred will be invested at birth for investment with maturity on their 18th birthday. That’s an upfront cost of $1.5m in Year 1 based on the current birthrate. I’m not against the idea in principle, just clarifying that there WILL be some immediate cost. So does anyone wonder if the pension has been underfunded all this time then how will this be funded? The OBA has saved Bermuda’s economy . This is a direct benefit to all of us. Finance Minister Bob Richards has saved thousands of jobs . While things have been tough, they are getting better for many . Soon, that “many,” will be , “all”. We must continue to work together in 2017 . Rodney you should be out knocking on doors, rather then here making a bigger clown of yourself. They stuck your in a place where they know you would never stand a chance of winning. But I guess the 15 minutes of fame got the better part of you. After July I will be looking to hire another clown, think you will fill the roll. Where can I grab an application? How did SpongeBob save thousands of jobs, when he threatened with furlow days and with de you have until noon speach, he got de shock of his life. Without those furlough days, they would have had to lay people off. Remember, to avoid continuing the furlough days, the union agreed to cut funds from social service programs, something Minister Richards wanted to avoid by continuing the furlough days program. Rodney Smith: You and the rest of the UBP/OBA never mention the social injustice that those of us have experienced under this corporatist party. As a “Christian” You should know the Scripture that states what you have done to the least of these you have done unto me. It appears you are a Christian in name only. Well don’t just say it , please supply a list of all those social injustices for those of us who don’t believe you . Sorry but can I ask what social injustice you have suffered? Seriously. Please can you explain what social injustices you have experienced in the last 4 years? Would help to understand your point. Then please explain how you benefited under the PLP who used borrowed money (debt) to pay for the social causes, money (debt) that stops and needs to be paid back. Listen to Shawn Crockwell’s speech that should clarify it for you. we beg your forgiveness: pardon, absolution, exoneration, remission, dispensation, indulgence, clemency, mercy; reprieve, amnesty) legislation? Who thought that up? Do they mean a sincere apology, restorative justice for those persecuted for cannabis for no good reason all these years and immediate de-scheduling of the plant and disqualification from all penalties, or some silly ‘if you get caught and you’re young, a first time offender, have a miniscule amount, admit guilt, beg for forgiveness and go to rehab and we might forgive you BS? I think there both full of hot air on both sides. I don’t vote any party because I think Bermuda is to small for party politics. Ive been in Spanish point 6-7 years and haven’t seen OBA,PLP NBA UBP NFL NOT ONE. They can all do the job until it comes time to doing it. Well if you dont vote, shut de F! @# up. How do you shut up typing? No, you idiots who vote for a representative and a party shut de eff up and let your party rep talk for you, those of us who don,t vote for the ‘better of two evils’ are free to speak for ourselves. Furthermore whoever wins can’t know who voted for them, ballots are cast in secret, so they have to listen to and work for everyone including those who didn’t vote, get it straight. People fought for the freedom to vote, not to make you bound to vote if the only two groups are self serving tricksters. Optics 101. No core UBP-ers save for Bob and Dunkley. All “fresh” faces when meanwhile the true powerbrokers stay in the shadows. Cause if anyone thinks that true OBA policy is made by the team pictured then I have an airport to sell you. Oh wait….that’s gone already. I have read and listened to the platform, and I am encouraged by what is being put forward by the OBA. I believe the OBA deserves more time in order to start working on these things and to bring them to fruition. Good Job OBA! It is not easy, but let’s move forward together and not back! The OBA didn’t make everyone on the island rich and care-free of their problems in 4-5 years so they clearly aren’t doing good enough and the plp needs another turn to “bring the island to its knees”. No mention of immigration policies? What is to become of Pathways to Status and the many families who are currently in limbo? We’re still waiting on those 2,000 jobs they promised! …..still waiting to hear where the PLP misspent all those millions that put us in this position…..5 years later! PLP platform is weak, can’t address where money will come from for all these fluffy dreams. It’s all hearsay, but the flock follow. You can lead a horse to water…. Let’s get 2012 platform finish first! Attempting to flip the script ,AGAIN . All of a sudden this OBA/UBP has a social conscious ! Where the heck did it come from ? I shall tell you …. From the same surrogate play book , written in 2011 . Only this episode is titled , Part Two ! What we got was … Pepper Spray ! Dished out by the Bermuda Police Service ! We do, who approved the budget for the deployment, training and operational protocols for the use of pepper spray… the PLP. The introduction of pepper spray was provisioned while they were in power. The police are paid by government, being a government service, but answer to the governor. I couldn’t put this more simply. If you knowingly break the law there are consequences. Don’t cry to me about some spray-on hot sauce. Forgetting who lied to those people to stick them in front of the house, riling them emotionally up with lies so they wouldn’t face a debate of the facts. Setting an emotional tinderbox in an unjustifiable act of civil disobedience, with a few hyper aggitated individuals who were confrontational with the police long before they tried a passive wedge to break the blockade. No one, he resigned over the mess he got himself into. Because you deserved it. Learn how to behave like an adult in society, please.